Object transfer is a mechanism that allows to change the designated registrar of an object. Each object has authorization information (or authinfo, also called a transfer password) that must be provided with the transfer request to authorize the transfer. 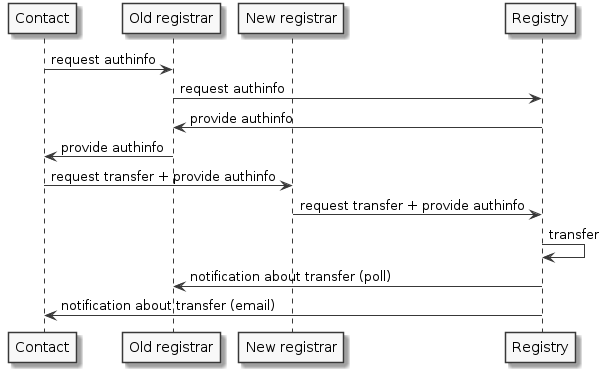 A contact linked to an object intended for transfer requests authinfo of the object. He can do so via the current registrar, via the new registrar or by submitting a public request to the Registry directly. The authinfo is provided to the contact either through one of the involved registrars or sent from the Registry. The contact requests the transfer from the new registrar and provides the authinfo. The new registrar requests the transfer from the Registry (via EPP) and provides the authinfo. The Registry transfers the object immediately and generates new authinfo for the transferred object. The Registry notifies the old registrar and the linked contacts about the transfer. This model favours the holder because it does not allow the current designated registrar to reject nor inhibit the transfer. A transfer of a domain may also be authorized using authinfo of the domain holder or any of its administrative contacts. A transfer of an nsset or keyset may also be authorized using authinfo of any of its technical contacts.